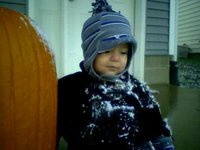 the look on my angel's face as he saw his first snow flake quickly changed my mind... snowballs...hot cocoa...Christmas lights - bring it on Winter! Wow...4 hours really makes a difference!! It's 43 degrees here, but not snowing. Hey, I haven't gotten the sling yet, I'm a little concerned since I'm moving Sunday. I hope it gets here tomorrow or Saturday?! Do you have a tracking # or anything??? That's funny... we're having a strangely warm October.